Bathroom remodeling is one home improvement job that is done not so often. So make sure you do it right. You should be able to achieve the very purpose of your remodel. In that way, you are not wasting the money and the time you are allocating for that project. The plumbing system. Of all the elements of your bathroom, the plumbing system is one of the most important and therefore should be carefully planned. For instance, a typical bathroom uses 1 ½ inch pipes for drain, but you can choose to upgrade that into 2-inch pipes to significantly reduce plumbing issues such as clogging. The larger the drain, the less likely it is to clog. The lighting. Make use of energy more efficiently by installing the right kind of lighting. This can be done by considering a design that sufficiently harnesses the natural light. That way, you can reduce the use of electricity. In connection with this, you are going to consider also the right location and design of your bathroom windows and the right materials to be used for it in order to allow more natural light to come in. The bathroom cabinets. You have a new member in your family? As your children get older, their needs are changing, including the items they use in the bathroom – personal stuff like a new set of bath towels, personal hygiene products – that might need additional space. Consider the use of bathroom cabinets to make use of the space more efficiently and in a more organized way. Ventilation. Proper ventilation is also an important consideration that you should not overlook. It provides your place a breathing space that is beneficial for the users. When the space is properly ventilated, the temperature of the inside atmosphere is more controlled – you do not need to worry about the sudden change in temperature outside. Plus, it offers a more safe environment. For instance, some bathroom cleaners are made of aggressive chemicals that can negatively impact breathing. A well ventilated bathroom helps avoid nose and lungs irritation from harsh chemicals. For professional bathroom remodeling, Rancho Bernardo, CA, call us at (760) 591-0070. Need a remodeling service for your Shower Enclosures in Del Mar, CA? Del Mar’s home for quality custom cabinetry since 1980. Scandinavian Cabinets delivers unparalleled professional design and extremely skilled installation. Custom Cabinets in Del Mar, CA for the bathroom and kitchen remodeling are our specialty. Scandinavian Cabinets builds world-class custom cabinetry designed to fit your space and style. Our custom cabinetry is 100% built-to-order. Exceptional value, highest quality and affordability! Don’t make the mistake of hiring any other contractor until you’ve talked to Scandinavian Cabinets. Give us the opportunity to earn your trust and business, you’ll be absolutely thrilled you did! Don’t wait, give us a call right now and get a same-day quote on the phone. Our cabinets are more than just storage. They’re an instant focal point for any room, tying the space together while setting it apart. Kitchens, media centers, baths, offices, bars — our pieces make every room stand out. Whatever you remodel needs, we are the “One-Stop Shop” to help you get the job done professionally, at the best price, and in a timely manner! Most remodels are completed within seven business days of the tear out. Complete contracting services from tear out to completed remodel. There’s good reason why Scandinavian Cabinets has so many happy clients throughout Del Mar, CA. What local areas in Del Mar do we service? We proudly service every city and zip code in San Diego County / Del Mar, CA. Custom cabinet design and installation requires dedicated hard working crews. We salute all the talented workers in our industry! For fun and interest we like to share various newsworthy items with our readers that you may find useful or entertaining. So please browse and read through the selections of news articles, videos, pictures and social buzz below to get a look at other related news in our industry right now. Enjoy and thanks a bunch for visiting our site! Working on a project such as bathroom remodeling, Del Mar, CA, merits careful planning. After all, this project involves some serious amount money that you cannot afford to let go down the drain. You need to put into consideration a number of things before you commence the project. Functionality. When your bathroom is no longer delivering its intended functions, a bathroom remodeling might be needed. For instance, is the current layout ideal for the type of user you have? Is it for a single person use or a family bathroom? How about the plumbing? Your bathroom might need bigger pipes to accommodate more wastewater. Is it wide enough or you need more space? Does it have enough bathroom cabinets to accommodate your things? If you think something must be changed (based on the questions above), consider bathroom remodeling..
Aesthetics. When something is pleasing to the eye, it affects our mood positively, which can help to start your day off right. If you think your bathroom design is dull and boring, it may be high time to do some makeover. A simple improvement on your bathroom wall design or by adding new aesthetic elements – even a mere change in color theme – inside can make a big difference when it comes to aesthetics improvement. You do not need to worry about new designs as companies that provides bathroom remodeling usually have a gallery of options to choose from. Picking a good remodel design will be relatively easy. Energy, water efficiency. Did you know that by allowing more natural lights inside your bathroom can save more energy? How about installing a water-efficient showerhead? These are just a few considerations when you want your bathroom to become more efficient. If your bathroom requires more electrical lightings, which increases your electricity bills, it is a wise decision to remodel your bathroom to a design that let more natural light (sunlight) in. Your bathroom remodel company should be able to suggest about the best way to materialize that. Looking for a reputable company that offers bathroom remodeling, Del Mar, CA? Contact Scandinavian Marble today! Need a remodeling service for your Bathroom or Kitchen design in Encinitas, CA? Encinitas’ home for quality custom cabinetry since 1980. Custom Cabinets Encinitas, CA for the bathroom and kitchen remodeling are our specialty. 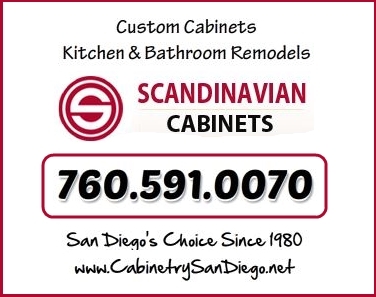 There’s good reason why Scandinavian Cabinets has so many happy clients throughout Encinitas, CA. What local areas in Encinitas do we service? We proudly service every city and zip code in San Diego County / Encinitas, CA. Planning to do some bathroom remodeling, Rancho Bernardo, CA? The success of your project will greatly depend on two things: (1) How certain you are of the elements that you want to add in your bathroom upgrade and (2) How expert is the bathroom remodeling company you are hiring to work with you in the project. To help you make the most out bathroom remodeling, we are giving you some tips in this post that you might find useful. The partition – Should you put a partition or division that separate the toilet area from your shower? Both have different advantages and disadvantages, which is why you have to decide based on your unique need. Storage – This is another yet an important element of your bathroom that you should carefully plan. You would want to have bathroom storage / bathroom cabinets because they are helpful when organizing your stuff inside your bathroom. At the same time, they can add to the bathroom’s overall aesthetic appeal. However, you have to add storage in such a way that it does not occupy more space, making the place more tight. The lighting – You might prefer a bathroom that is brighter or one that has a dimmer lighting; whichever you choose, make sure that it does not compromise the safety of the user (i.e. it should have enough light to avoid potential accident). As mentioned above, the company you hire for bathroom remodeling, Rancho Bernardo, CA plays an important role for the success of the said project. Make sure that the one you hire is reputable and one that has been proven expert to do the job. The recommendation – Are there reputable organizations that recommend your prospective bathroom remodeling company? The reviews from clients – What people/clients are saying about the company? Are there way more positive reviews than the negative ones? The length of time in service – Has the company been there for decades or just started in business a couple of years ago? Again, the success of your bathroom remodel greatly depends on how diligent you are on knowing the necessary elements of a perfect bathroom, and on the level of expertise of the company hire to do the job. Contact us for professional bathroom remodeling, Rancho Bernardo, CA at (760) 591-0070.